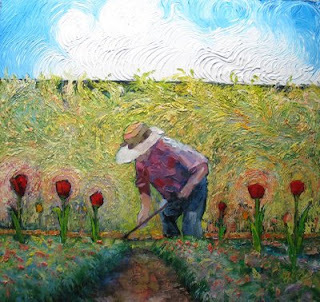 This painting "Man In His Garden", was juried into the Coos Art Museum, "Expressions West" show, http://coosart.org/expressions/ew9/EXW09-Slideshow/index.html. It didn't win an award which is somewhat disapointing but then, from the ones that were selected my work isn't the style that has been in vogue the last couple years. I'm leaning more to a unique presentation technique wise and the show seems to be favoring the 'old school' paradigm of realism. I'm not critisizing at all, I like every type of art. I do appreciate getting juried in as that is a measure of acknowledgment. Sitting out here in the expanse of the reservation it's difficult to measure my progress so getting into these shows is a way to do that. Personally I'm jazzed about what's going on with this piece. It's solid in many ways, composition, color key but most of all I've developed my own way of painting that has lots of potential for development. I'm already onto the next level that came out of this effort. 3, 20x60, panels that are a landscape tryptic that has gone well. Like this painting, lots of paint, carved with a pallet knife. The type of style suited to an ex horse logger. "Man In His Garden", is available during this show for $1500.